Air Canada during the last couple of years has worked diligently to repair its balance sheet, improve its leverage and reduce costs; as a result it is now beginning to enjoy some of the fruits of its labour by meeting its return targets and sustaining liquidity well above its minimum threshold. The Canadian flag carrier has also undertaken a network revamp that includes the creation of its low cost subsidiary rouge and a push into long-haul international markets, leveraging its position as Canada’s leading global airline. But Air Canada faces challenges as it works to sustain profitability from its familiar foe WestJet, as well as potential new entrants eager to execute the ULCC model within Canada. The airline will no doubt have focussed on these threats, and be aware there is still much to prove as its efforts to transform its business continue. This CAPA analysis of Air Canada's strengths, weaknesses, opportunities and threats continues a series on global airlines. Air Canada is now working off a much stronger financial foundation after taking steps to improve its leverage, cash balance and return targets during the last few years. Part of its ability to rework its balance sheet was driven by labour contracts that were imposed by federal arbitrators following disputes during 2012. But the airline has also undertaken various other cost reduction schemes while working to repair its balance sheet. These efforts have culminated in Air Canada achieving a 11.4% return on invested capital for the 12M ending Sep-2014, which is within its targeted 10% to 13% range. Throughout the last year Air Canada’s liquidity has remained above its stated CAD1.7 billion (USD1.4 billion) target minimum, and as of 30-Sep-2014 its CAD2.8 billion (USD2.4 billion)represented roughly 21% of its last 12M revenues. 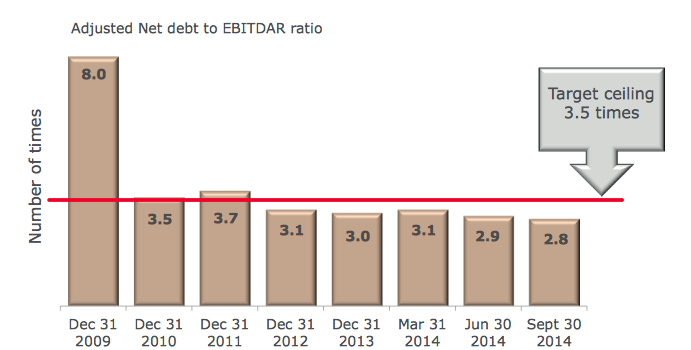 The airline is also working to attain its targeted adjusted net debt to EBITAR of 3.5x. Air Canada has also managed,for now, to win the wrestling match with its pension liabilities (albeit with some governmental aid). A recent report in the Canadian news outlet the Financial Post stated that at the beginning of 2014 Air Canada had a small surplus in its pension plan compared with a CAD3.7 billion (CAD3.1 billion) deficit a year earlier. Air Canada and WestJet have enjoyed a duopoly in Canada’s market for more than a decade. 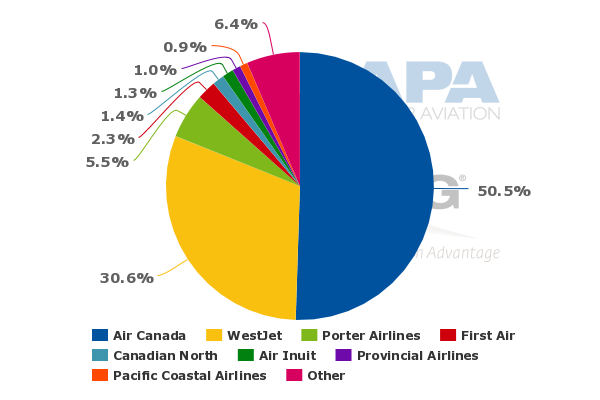 But Air Canada still holds a position of strength in Canada’s aviation industry, representing a nearly 51% domestic seat share for the week of 5-Jan-2015 to 11-Jan-2015, and a 34% share of international seats. The airline during the last two years had undertaken a push into long-haul markets, concluding that it has not grown in line with available opportunities on long haul routes during the last decade. 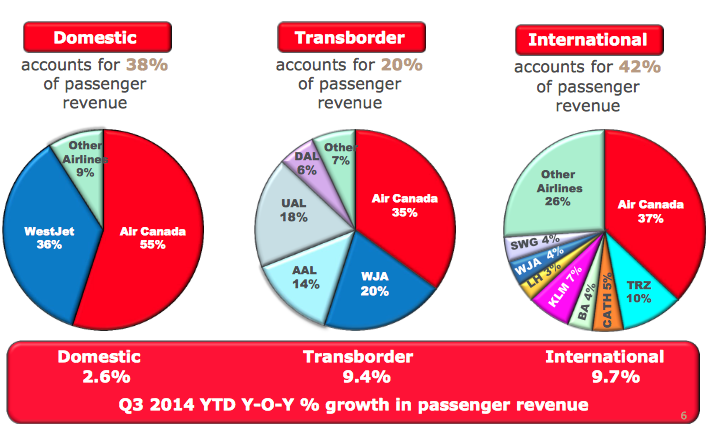 At the end of 3Q2014, international markets excluding transborder (US) flights represented 42% of Air Canada’s total revenues, and revenue growth in that segment increased 9.7% year-on-year, the fast among its three large geographies. Air Canada is proactively working to leverage the value of its position as Canada’s leading airline in long-haul markets, tapping its Star Alliance partnerships and its leading positions at hubs in Toronto, Montreal and Vancouver to flesh out its long-haul network to various destinations; these include the resumption of flights to Delhi and new service to Dubai in 2015. It has also transitioned flights to LCC subsidiary rouge on some long-haul markets, which has resulted in improved fortunes on those routes due to rouge’s lower cost structure. Since Air Canada persuaded unions to accept the new long-haul low cost subsidiary, launched in mid-2013, rouge has progressively shown its effectiveness as a low cost alternative to its parent in lower yielding, predominantly leisure markets. In Dec-2014 for example the airline announced that rouge would expand the group's operations to Mexico and the Caribbean, simultaneously replacing some mainline services in those markets, effective 01-May-2015. Air Canada rouge now operates a fleet of 20 A319s and 8 767-300ERs, already a formidable force in long haul leisure service. The venture has been blessed by good fortune as fuel prices slump, as the average age of these aircraft, handed down from the parent, is 17 years (although the fall in the CAD has generally had a negative impact on costs for Canadian companies). Air Canada estimates that unit costs on rouge's Airbus A321 narrowbodies are 21% lower than those operated by mainline crews, while the unit cost differential for rouge's Boeing 767s is 29%. As rouge continues its expansion, the opposition by mainline pilots to the creation of the low cost airline has muted, and Air Canada's pilots now are beginning to conclude that rouge is an important element for Air Canada's long-term viability. In May-2015 rouge begins operation of its first Asian route from Vancouver to Osaka, Japan, and also plans to assume Air Canada mainline flights from Toronto to Lima, Peru, its first market in Latin America. Air Canada is also broadening rouge's European footprint wit new service from Montreal to Venice. rouge now operates from Air Canada's hubs in Toronto, Montreal, Vancouver and Calgary to destinations in the US, Europe and the Caribbean. The planned new service to Asia and Latin America reflects Air Canada's confidence that its lower cost subsidiary is delivering on its goals. It is still early days for the airline, but Air Canada seems to have worked hard (and studied the failures and successes of other failed ventures) to prove it understands how to effectively manage a low cost subsidiary. Air Canada's trans-Atlantic immunised joint venture with its Star Alliance partners United and Lufthansa is a tool the airline can use to tout a much broader network to customers and combat changing competitive dynamics including overcapacity in the market that occurred in 2H2014. For the winter 2015 period the entity is cutting its trans-Atlantic capacity by 0.5%. 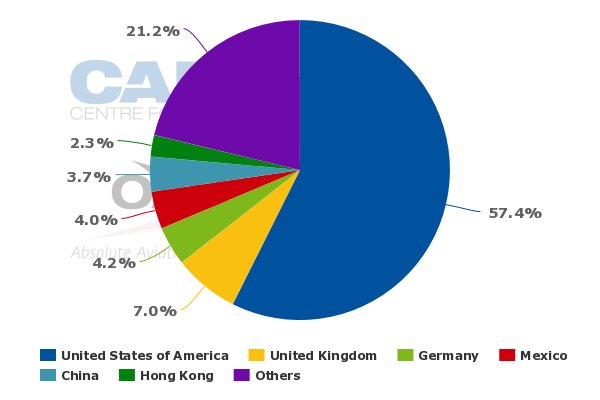 Even with the adjustments, the Star partners retain a roughly 25% seat share from North America to Europe for the week of 5-Jan-2015 to 11-Jan-20115. 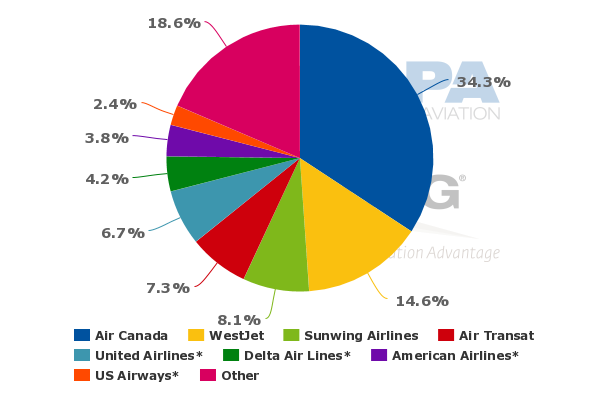 The oneworld joint venture among American Airlines, British Airways, Finnair and Iberia represents and approximate 23% share (26% when including US Airways) and the SkyTeam immunised partners Delta, Air France-KLM and Alitalia hold a roughly 23% share. Being able to market the joint networks of its Star joint venture partners gives Air Canada leverage in global blanket coverage while allowing it to work with its partners to determine favourable pricing and capacity levels. Based on data from CAPA and OAG for the week of 5-Jan-2015 to 11-Jan-2015 the Star Alliance holds a 19.7% global capacity share compared with 15.7% for oneworld and 18.5% for SkyTeam. While the merits of alliance membership are increasingly debatable in the current global aviation industry, Air Canada has shown it can use its membership to greatly enhance its network scope to offer more depth and breadth than some of its Canadian and North American competitors, for now. Air Canada has a stated goal of reducing its unit costs by 15% from 2012 levels over the medium term. For the first nine months of 2014 its adjusted unit costs (which excludes fuel) fell 3.5%, and it expects full year unit costs to decrease 2.5% to 3.5%. But Air Canada’s yields also decreased 1% as a result of an effort to densify its aircraft that has resulted in larger percentage of economy class seats on offer and longer stage lengths. The trade off in cost versus yields is part of Air Canada’s business strategy. It has concluded that its unit costs will fall at a faster rate than yield and unit revenues decline, which will still generate strong financial results. It is a delicate path for Air Canada to navigate. The company originally estimated its unit costs excluding fuel would fall 3.2% to 4.2% in 2014, but refined that guidance at the end of 3Q2014 due to higher than expected depreciation expense and employee profit sharing. Air Canada will inevitably face these types of cost revisions as it works to meet its unit cost targets, and for now the company is still lowering its costs faster than yields are declining. But there could be some competitive pricing action in the market during 2015 due to lower fuel costs, and potential new ULCC entrants. If Air Canada is forced into further fare discounting, its net yield decline could accelerate. rouge seems to be delivering the necessary cost reductions for Air Canada to make previously weak leisure routes viable, but the company has faced some consumer backlash during the transition of some routes to rouge, whose Airbus A319s and Boeing 767s have a denser configuration than mainline aircraft, resulting in a tighter pitch. Air Canada has indicated it aims to improve passenger understanding of rouge, which seems to suggest that the company may need to factor in different passenger sentiments as rouge continues to expand. With rouge and other changes to its product, including the introduction of a premium economy, Air Canada is aiming to serve all ends of the passenger spectrum. That is something arguably necessary in Canada’s aviation industry, whose passenger pool is smaller than the US, but with so much change occurring at Air Canada, avoiding customer confusion and backlash is paramount in order for the airline to successfully cater to all passenger segments. Air Canada pilots recently ratified a 10-year contract that includes pay raises, a signing bonus and improved profit sharing. News outlet the Globe and Mail recently reported that it was the first agreement that Air Canada and its pilots had reached since 1996 achieved without a strike or arbitration. The publication also reported that the deal includes provision for pilots giving up the right to strike by agreeing to send disagreements to mediation or arbitration if the airline meets its growth targets. It is a far cry from 2012 when Air Canada and its unionised employee groups were locked in bitter negotiations that resulted in work stoppages and eventually ended with contracts imposed on work groups by a federal arbitrator. A continuing warming of relations between management and employee groups is crucial for Air Canada to continue to build the sustainable profitability it seeks to achieve. Perhaps both management and unions have learned lessons that can be applied to future negotiations. If this is able to be maintained, the prospects for adaptation to new market conditions are improved. During the past couple of years Air Canada has targeted sixth freedom traffic flows from the US through its Canadian hubs to its long haul destinations. It has forged an agreement with Toronto Pearson airport to make the transfer process seamless, and has targeted US markets that have scant international service for long-haul passengers. Previously, Air Canada has estimated that sixth freedom traffic could generate USD400 million in annual revenue. Air Canada has expanded its footprint in Asia during the last couple of years with new service including Seoul and Tokyo Narita and expanded offerings in existing markets. Further expansion into Asia during the next couple of years is key for Air Canada as its main rival WestJet readies for widebody expansion and Air Canada’s US rivals also solidify their Pacific strategies. Vast connectivity will be a major competitive attribute for Air Canada going forward in order for the airline to keep a certain level of network superiority above its rivals. The bulk of Air Canada’s international capacity (measured by seats) is still deployed to North America, and the Canada-transborder market is highly competitive. Amping up its long-haul offerings is key for Air Canada to remain a competitive global airline, something that does not seem to be lost on the airline’s management. WestJet is adding Glasgow to its stop-over service to Dublin for the summer 2015 season. It launched seasonal flights from Toronto via St John’s to Dublin in 2014, and now is adding Glasgow through a stop-over in Halifax to its trans-Atlantic seasonal roster. The airline is also acquiring four Boeing 767-300ERs for new long-haul operations set to debut in late 2015. Initially WestJet is operating the aircraft on flights from Alberta to Hawaii, but the one-stop trans-Atlantic flights have no doubt given WestJet insight into that particular market, and it is only a matter of time before Air Canada encounters WestJet on direct long-haul flights, something Air Canada has obviously anticipated, evidenced by management’s aggressiveness with unions in creating rouge. Air Canada has estimated that the Airbus A319s operated by rouge have a 21% lower unit costs than similar mainline jets. The unit cost differential between rouge’s 767 and mainline 767s is 29%. But even with the strides Air Canada has made with its unit costs and the operation of rouge, WestJet remains focussed on maintaining its long-held cost advantage over Air Canada. Its unit costs excluding fuel and profit share fell 1.6% for the 9M ending 30-Sep-2015, but WestJet is working off a still lower cost base than its rival. Similar to US hybrid airline JetBlue, WestJet opts to leverage its strength as Canada's second largest airline with numerous airline partners rather than becoming boxed in an alliance. It as roughly 11 airline codeshares and nearly 30 interline agreements. Its codeshare partners outside North America include Air France, British Airways, Cathay Pacific, China Eastern, China Southern, Japan Airlines KLM, Korean Air and Qantas. Once WestJet starts its long-haul international expansion in full force, those partnerships, particularly with Asian airlines, will allow the airline to offer passengers a level of network breadth that may not reach the level of Air Canada, but will certainly create new competitive threats for Canada's largest airlines. Two aspiring ULCCs – Jetlines and Jet Naked – have declared their intent to operate an ultra low cost model within the Canadian market place. Jetlines seems further along in the process, making a splash in late 2014 with an order for Boeing 737 Max aircraft. Until deliveries begin in 2012 the airline plans to operate leased Boeing narrowbodies. The airline through its merger partner Inovent Capital has filed paperwork to raise funding for launch, which is targeted for some time in 2015. Jetlines’ debut will not result in a flooding of capacity in the market, but it could create some price disruption for both Air Canada and WestJet in certain markets. Air Canada plans an overall 9% to 10% capacity increase in 2015, with a 4% to 5% rise in the domestic market. Its rival WestJet is planning a similar level of domestic capacity growth. Each airline’s capacity increase is outpacing Canada’s projected 2.4% GDP growth in 2015; but the airlines both stress that demand remains strong, and their stimulation strategies are driving that strength. If external factors arise to upset domestic demand, it could be tough for the airlines to quickly rein in the growth, and yields could face pressure. Air Canada has successfully prevented efforts by Emirates to persuade the Canadian government to allow more service between the UAE and Canada under the current bilateral governing air transport between the two countries, which allows for Emirates and Etihad to operate six weekly flights to Canada. Air Canada argued that expanded service by those airlines would flood the market with too many seats that would divert international travellers through Dubai. Now Air Canada is launching its own service to Dubai, and on a broader scale Canada will undoubtedly be revisiting its approach to bilateral aviation agreements as its financial condition strengthens. With Air Canada reaching a level of competitive global strength, the fragility the government has sought to protect has arguably diminshed. Of course the risk to Air Canada in further liberalisation of air services is facing real competition from the Gulf airlines, which have set their sights on gaining a foothold in the Americas, evidenced by their rapid expansion into the US during recent years. The product superiority and the ease of connectivity offered by Gulf airlines could pose new challenges to Air Canada, if Canada opts to allow its international aviation industry to operate in a traditional free market environment. Air Canada has however demonstrated some ability to adapt, already establishing a loose relationship with Etihad. Air Canada has made remarkable progress in improving its financial fundamentals, lowering costs and working to cater to all passenger segments. Importantly too there appears to have been a solid start on the road to a substantial cultural shift. But there is still much to do in successfully executing the strategy that the airline believes will transform its business into sustained profitability. Much of the company’s future is based on long-haul expansion, which can be a complex proposition with the maturity of routes tough to predict depending on the region. In its home market Air Canada faces an always strong WestJet and potential new rivals eager to prove that Canada might finally be fertile ground for the ULCC model. None of those challenges is new or surprising to Air Canada. But they are formidable all the same, and require Air Canada to remain steadfast in its commitments to lowering costs, responsible capacity growth and keeping its hard-won financial strength intact.